One of the most monumental days not just in baseball history, but in all of American history. Jackie Robinson made his Major League debut for the Brooklyn Dodgers. And so I finally watched 42, the 2013 film that brings his rookie season to life. 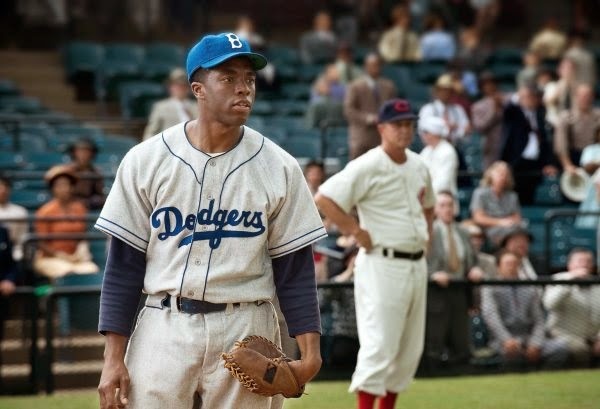 Unknown actor Chadwick Boseman gets his big break and plays the star who not only became the first black man in the league but also went on to play in six World Series - winning one, in 1955. Boseman is likable and was the right choice. Harrison Ford is also exceptional as Branch Rickey, the Dodgers' owner who was determined to do the right thing for society and baseball. Some of the most powerful scenes include when Philadelphia Phillies manger Ben Chapman yells terrible obscenities from the dugout as Robinson stands in the batters box, teammate Pee Wee Reese's transition to being on Jackie's side, and some of the behind-the-scenes dealing of Rickey and others to make Robinson happen at that time. There are several inaccuracies to make 42 a little more dramatic. But overall, this look at one slice (the biggest slice) of Robinson's career is depicted very well. It's a crucial story to be told and retold and 42 serves it well.